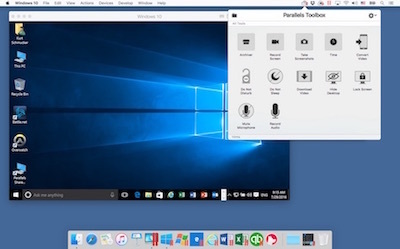 Earlier this month, Parallels launched the latest upgrade to their best selling software for running Windows on a Mac. Parallels Desktop 12 for Mac Pro Edition is an update to Parallels Desktop 11. See my MyMac review from last year. This update fully supports Windows 10 and is MacOS Sierra ready with performance improvements up to 25%. Aligning with the previous version of the product, Desktop 12 supports Chrome, Android, and various versions of Unix and Linux. New features include a standalone Parallels toolbox app offering many single-function tools and utilities, as well as a one-year subscription to Acronis True Image backup service for up to 500 GB of free online storage. Take Screenshots utility allows you to capture a screenshot of an area, single window, or screen with the click of a button. Some performance improvements include faster VM suspension with high RAM VMs suspension up to 60% faster. Creating snapshots, saved states of the VM that you can revert back, are 90% faster. 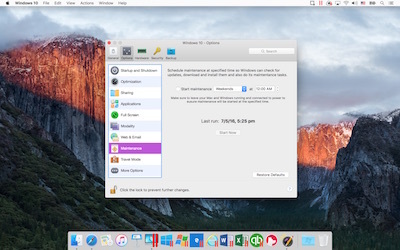 In addition, VMs are more responsive when your Mac is low on free memory. Benchmark of Visual Studio project compilation on shared folders demonstrated a 25% improvement. All these performance improvements are great news for the developer. Parallels Desktop 12 has a number of VM management and control features such as the VM backup solution which includes a one-year subscription to Acronis True Image 500 GB cloud backup storage. You are able to perform incremental backups as well as instant updates when changes are made. In MacOS Sierra, you will be able to manage VM storage space from Optimized Storage. In addition, the Pro Edition of Desktop 12 allows setting of VM resource usage limits and archival of VMs to save space. There is also a way to cancel time-consuming VM actions and improved retina support for resizing Windows VMs. The Pro Edition includes Network Conditioner, which has preconfigured network profiles allowing quick and easy network configurations. For Windows VM OS update management, Desktop 12 allows scheduling to avoid time-consuming disruptions during your workday. Other Windows VM features include: storage of Microsoft Edge and Internet Explorer passwords in Mac keychains, ability to open documents from Sharepoint and Office 365 in Microsoft Office for Windows desktop applications directly from Mac browsers, keep Windows running in the background to allow instant opening of Windows applications and documents, and Outlook for Windows has access to recently accessed documents to attach to emails. The ability to assign special behaviors to Windows Apps, such as, Always Open Full Screen or Always Hide Other Apps, allows the user to customize their desktop to their own preferences. Parallels Desktop 12 for Mac understands the adage about all work and no play. For the gamers, there is support for Blizzard Entertainment Overwatch PC game. 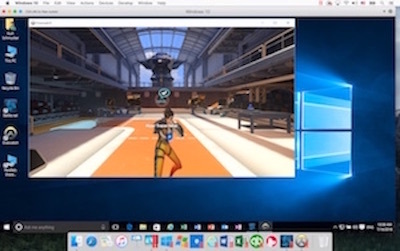 For streaming and playing Xbox games on the Mac, there is support for Windows 10 Xbox app. 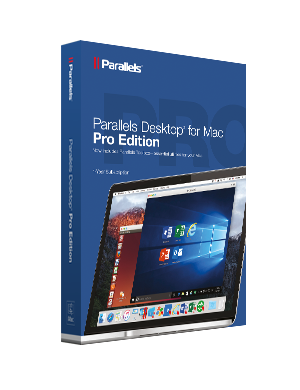 Parallels Desktop 12 for Mac Pro Edition is a major upgrade with many features that its target user of developers, web and graphic designers, power users, and other demanding pros, will find extremely useful. The Parallels Toolbox App is a must have for any user wanting a one-click solution to common tasks. Again, Parallels has managed to take this application to a new level. I can’t wait to see the new features in next year’s release.